Life in a chair is a hazard that is often overlooked. But what some don’t realize is how bad it really is for your body. 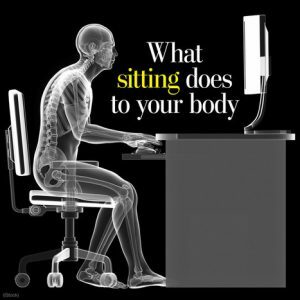 Overall, sitting for long periods of time can cause many negative effects and can cause lower back pain. Most of the negative effect tends to be long term problems. Sound familiar? Sitting all day is the worst thing you can do to your back. It puts twice the stress on your spine than standing. The problem worsens when you slouch forward. This causes even more pressure on your spine since it pushes your back into a C shape which is not a normal shape for a human spine. Try to add every possible workout you can into your busy schedule. If you have a 10 minute walk to work, then avoid taking the train or bus. If you have a few flights of stairs, don’t take the elevator and walk instead. We’re all guilty of it; even though your boss is down hall you still use the phone or shoot him an email in order to ask a simple question. Don’t use the phone unless you really have to. Set an alarm or timer to give yourself a 5 minute break to stretch or to walk around the office. Anything to give your body a stretch after prolonged sitting. Working in an office or running your own business at home can mean a lot of phone usage. Try using a headset that allows you to pick up the phone form anywhere in the office, allowing you stand, walk, or even stretch out while taking a conference call.